Based on thousands of years of natural surroundings and the resulting diets, its was easily discovered that a variety of “superfoods” are delivering energy, beauty and youthfulness to people of all ages throughout South America. Several years, and many experimental recipes later, with the top scientists and top Japanese herbalists, youthH2O was born. 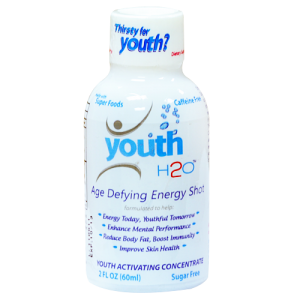 Comprised of 100% natural ingredients, vitamins, minerals and absolutely zero caffeine, youthH2O is a 2oz shot that delivers ongoing results, not a short-term fix like other products on the market. Taken once daily over 5 days, for 3 weeks, the effects of Youth H2O are felt within a few days and noticeable results in 2 weeks. Unlike caffeinated shots, users don’t end up back where they started; with youthH2O, it’s progress everyday. Those who use youthH2O cite increased energy, enhanced mood & libido, improved metabolism, restful sleep, and ongoing feelings of health and well-being. The effects of super foods have been studied for over a 100 years, but only now are these powers harnessed into a simple to drink, once daily shot. Organic maca, which is harvested over 13,000 feet above sea level in the mountains of Peru, is rich in calcium, magnesium, phosphorous and iron; contains minerals, including zinc, iodine, copper, selenium, bismuth, manganese and silica, as well as B vitamins. It also contains four alkaloids, proven in scientific investigation to nourish the endocrine glands, including the reproductive system of men and women. Camu Camu contains extraordinarily high levels of Vitamin C, and is known to improve skin health through an increase of collagen, which leads to a more youthful appearance. Pageant contestants often refer to it as the “glowing fruit” because of the skin glow it creates. Purple Corn extract is a known antioxidant that improves immunity, enhanced mood, libido, overall mental performance and has been extensively studied to aide weight loss and the prevention of obesity. Other natural ingredients in youthH2O include Vitamin C, B6 & B12, Folic Acid and Niacin. It is caffeine free, contains 0g fat and only 19 calories. After 5 shots of youthH2O for 3 consecutive weeks, users are recommended to take a break for 7-10 days, which allows the body to produce its own nutrients, promoting natural stability and internal balance. During this break, youthH2O continues to work its magic. Because of it’s energy boosting and antioxidant qualities, some users take their youthH20 prior to exercise, before going to work or school, when headed to a romantic occasion or when in highly populated areas or on an airplane. “Not all superfoods are created equal. You can have all the superfoods at your disposal, but the rare superfoods in youthH2O are those known to create the greatest effect and are unparalleled to many of superfoods marketed today,” said Zikria. youthH2O superfoods are not just rare and proven with data to be the best to meet its claims, they have been selected by top herbalists and scientists ensure maximum results.